Officials from the city of Grove City and Jackson Township are partnering to apply for funding assistance to improve and reconstruct 1.8 miles of Borror Road from Quail Creek Boulevard to State Route 104. 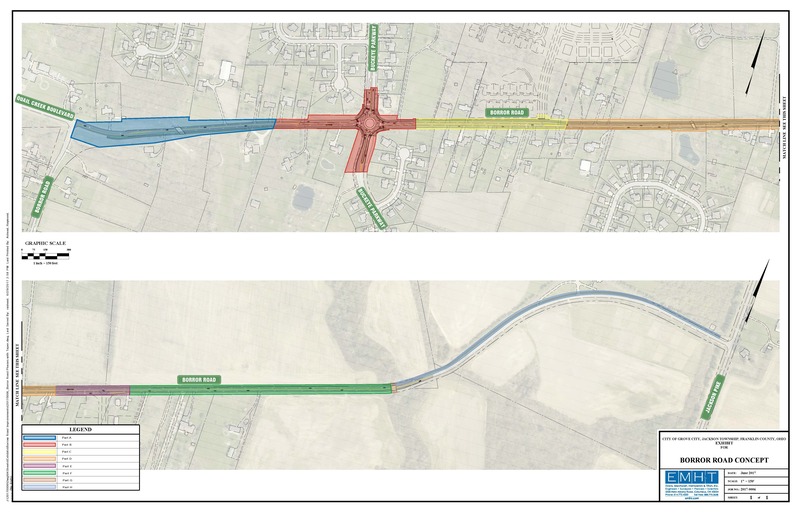 The estimated $6.2 million Borror Road project that is in the concept-development phase would include full-depth reclamation and roadway widening along with the addition of a roundabout at the intersection of Borror Road and Buckeye Parkway. Proposed improvements if funding assistance is awarded also would provide for a multi-use path, street lighting, water-main extension and updates to the storm-water system. Traffic engineers are holding an informational meeting for residents to learn more and seek answers to their questions. The Borror Road public meeting is set for 6:30 p.m. Sept. 5, 2017 at the Jackson Township Administration Building — 3756 Hoover Road in Grove City, Ohio. Contact Grove City Assistant Director of Public Service Jennifer Stachler at (614) 277-1100 or Jackson Township Administrator Mike Lilly at (614) 875-0100 for more information.